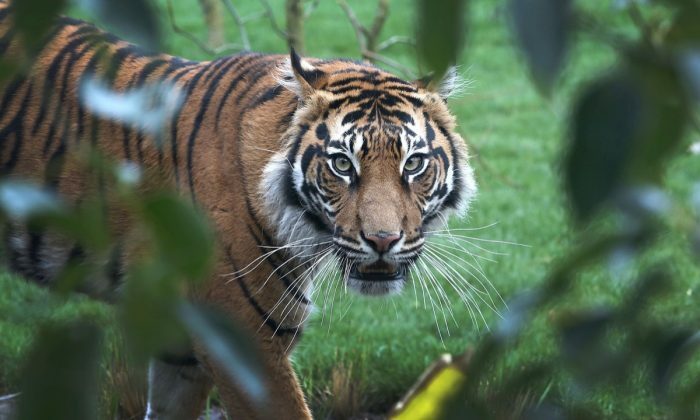 A tiger from a critically endangered group was killed by a potential mate at the London Zoo. The female Sumatran tiger’s enclosure was set up next to a male Sumatran tiger’s enclosure so that the zoo could later put the two tigers together. But after they were introduced into the same space, on Feb. 8, their interactions became aggressive, after an initially cautious approach to each other, according to the London Zoo’s website. Zoo staff had been carefully watching the two and thought they could breed as part of a conservation program for Sumatran tigers, according to Fox News. When zoo staff noticed what was going on, they tried to distract the tigers with flares, alarms, and loud sounds, they even tried to use water hoses to separate the two, according to the London Zoo website. Eventually, the tigers had to be separated, but by then the female tiger Melati was dead, upon her first time sharing an enclosure with her potential mate. “Today our beloved Sumatran tigress Melati died while being introduced to new male Asim for the first time. Everyone at ZSL London Zoo is heartbroken by this turn of events. Tiger Territory will remain closed while our team focus on caring for Asim,” the zoo wrote in a tweet. A tranquilizer shot would not have been effective, due to the amount of time needed for it to work and the difficulty of hitting the correct tiger with the shot, according to the London Zoo. The zoo acknowledged that there is a risk of danger in this process. The male tiger, Asim, was a newcomer to the zoo. He had been brought to the zoo at the end of January. He had previously resided in Denmark. The zoo thought Asim was a likable animal. “We learned that he adores chicken and loves to play, particularly by pouncing on piles of empty boxes sprayed with strong scents such as herbs and spices,” said zookeepers, via Sky News. The zoo had high hopes for the potential mating pair. The optimistic outlook continued as the two tigers got acquainted for the 10 days they lived in adjacent enclosures, where they could see each other, and get used to each other’s smell. “It’s early days but we’ve already seen some good signs—there has been lots of ‘chuffing,’ which is a happy sound they make to let each other know they have good intentions. It’s fantastic to see that they’re interested in each other already,” said the zoo, via Sky News. The zoo has since closed its tiger section. “Our team are focussed on caring for Asim, who has also been through an ordeal. He sustained a minor injury during the altercation and is being treated by our vets,” the team wrote on the London Zoo’s website.